When it comes to redesigning your kitchen or bathroom, custom cabinets add valuable storage space and a touch of luxury. Orange County homeowners shopping for stylish, affordable kitchen cabinets and bathroom vanities can count on Wholesale Cabinets, conveniently located in Florida, NY. Not only do they have the widest selection of RTA cabinets, Wholesale Cabinets has a knowledgeable design and cabinet installation team who can help you put together the kitchen and bathroom of your dreams. Custom cabinets give you the freedom to choose the features that are most important and useful to you, from the style and color to the types of storage. If the sheer number of options feels overwhelming, keep the following tips in mind to simplify the selection process. What Is Your Room’s Layout? 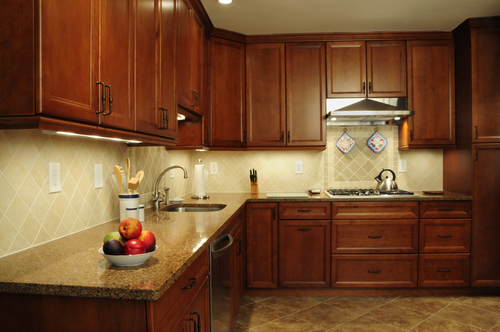 Custom cabinets vary in price depending on the material and the construction quality. Knowing how you want your new kitchen or bathroom configured will help you determine how many linear feet of cabinetry you need, as well as the most budget-friendly cost per linear foot. Maintaining the current layout of your room allows you to reuse existing utility hookups and plumbing lines, which can help you lower the overall cost of your renovation. What Is The Right Material For The Room? Kitchen and bathroom cabinets are exposed to heat and moisture every day, so it’s important to choose a material that can withstand those conditions. Materials like particleboard and MDF are affordable but tend to be sensitive to moisture, especially in places where holes have been drilled to accommodate hardware. To make sure every customer’s cabinets are built to last, Wholesale Cabinets offers only the highest-quality plywood and natural wood custom cabinets. Designing your new kitchen or bathroom isn’t just about figuring out where the cabinets are going to go—it’s about finding the best ways to store the items your family uses every day. This is especially true in rooms that have limited space, like bathrooms and small kitchens. Combining adjustable shelving and drawers ensures that every pot, pan, hair dryer, and spare towel will have its place. Visit Wholesale Cabinets online or in their showroom to learn more about their selection of custom cabinets and their design and installation services. Call (845) 508-6577 to get a quote for your project.